Back-to-back AFL Fantasy Classic winner, Selby Lee-Steere, has released his secrets on winning the competition. And just like that, AFL Fantasy is open for another season. It’s an exciting time of the year, putting together our initial teams and thinking they can’t be beaten, without the reality (and the stress) of watching your players under-deliver when the season starts. So I hope you all registered as soon as it opened! Now it’s time to do your research so you can nail your team for the start of the season. With that, I’m excited to announce the release of my 2019 AFL Fantasy Season Guide. Click here to purchase the season guide. After putting together my research last year, I made a last-minute decision to make it available to other keen coaches out there. I put a lot of work into my Fantasy research, so I thought why not share it and put the time to good use (thinking I couldn’t possibly win it again..). For a small donation, coaches received my research and together we managed to raise $6,500 for the Starlight Foundation. After being inspired by last year’s donation, I spent the summer building on the product with a goal of producing the ultimate AFL Fantasy Season Guide. I then assess every player on the stats I feel are most relevant to AFL Fantasy, followed by personalized thoughts on their prospects for the 2019 season. 193 pages of pure Fantasy gold. Once again, 100% of the proceeds from the sale of the document will be donated to the Starlight Foundation. 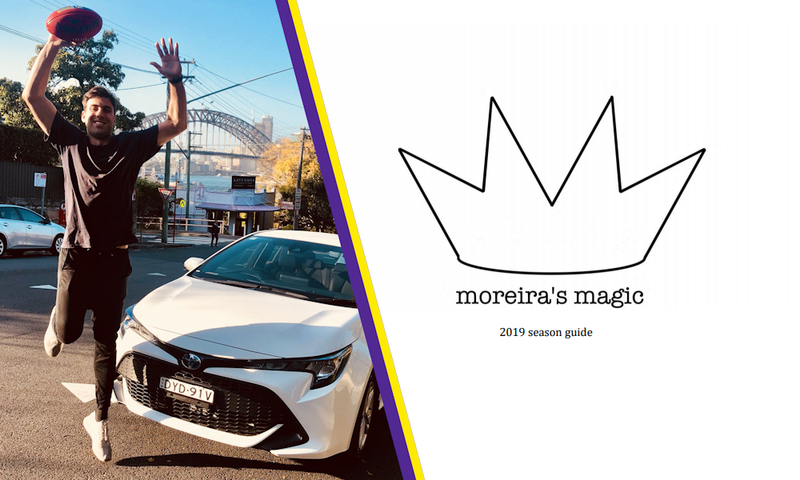 It’s available now via moreirasmagic.com. All the best for the 2019 Season. Follow Selby on Twitter – @MoreirasMagic. Hi, is this a hard copy book, or online? It’s an e-Book (193 pages). I can vouch that it’s a worthwhile buy; his advice is solid and how he differentiates himself from the pack. There’s lots of statistics to dig into for every player in the competition (including notes). Some of the metrics he uses aren’t the standard fare which is enlightening. I’m getting a lot from it (but I’m a bit of a statistical nerd).